THERE WAS a small field for the coveted position of Member for Warrandyte in the recently held State Election. Voters turned out in force in the two weeks’ prior to the November 24 poll with early voting numbers reported by the VEC to be almost double the 2014 pre-poll turnout. The seat of Warrandyte has been a comfortable Liberal seat for over 30 years, with incumbent Ryan Smith having held the seat for 12 years. Smith, having spent the last four years in opposition was keen to see a change of government as he fought hard on the Liberal platform of law and order. It was always going to be a difficult fight for control of the Spring Street government benches, but no one expected the massive swings across the state that strengthened Labor’s hold on power. Labor put in an out-of-towner in Elizabeth McGrath, clearly not expecting her to make inroads into the Blue Ribbon Liberal seat. However, despite Smith’s personal popularity in the electorate, he was not immune to the tsunami of sentiment away from the conservatives. His 11 per cent margin was eroded to see him sitting on a frustrating 49.8 per cent, meaning without an absolute majority, a preference distribution was required. Preferences swung the way of the incumbent, meaning that Ryan Smith was elected for the fourth term as Member of Warrandyte. The Liberal member’s Two Party Preferred majority now sits at around three per cent. Elizabeth McGrath attracted 35 per cent of the vote first preference for Labor, while Ben Ramcharan garnered a creditable 10 per cent for the Greens, with the Animal Justice Party’s Lachlan McGill taking four per cent of first preference votes. To the North of Warrandyte, the electorate of Eildon, which takes in Kangaroo Ground, Christmas Hills and a large swathe of the Nillumbik Green Wedge, Liberal incumbent also went to preferences to claim victory in the seat. In an almost carbon copy of the 2014 election result, Sally Brennan took a 35 per cent stake, while The Greens’ Ken Deacon took around 10 per cent of first preference votes and Independent Michelle Dunscombe retained her deposit with a five per cent share of the votes. The last weekend for Nillumbik Artists Open Studio is fast approaching, with November 24/25 – your last chance to take a sneak peak at local artists creative spaces. For more than 30 years, the Open Studio program connects art lovers to artists by inviting the public into their studios. “Nillumbik Artists Open Studios showcases diverse visual arts practices from painting, photography and printmaking to ceramics, sculpture, textiles and glass. “There is something for everyone,” said Nillumbik Mayor Peter Clarke. With six new artists added to the Open Studio bill, both locals and tourists will be spoilt for choice with 27 different artists across nearly a dozen artistic mediums. Of local interest is Open Studios newcomer Deborah Halpern, known for the Angel on Birrarung Mar and the Queen of the Shire which used to greet cars and pedestrians as they crossed Warrandyte Bridge. Visit the Nillumbik Open Studio website to download a program. 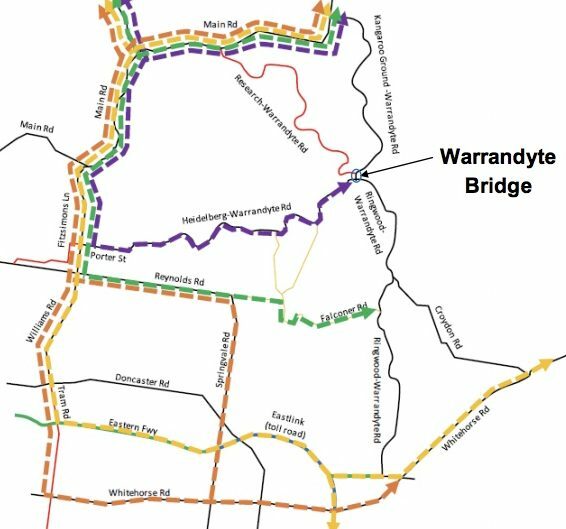 An overnight lane closure has been scheduled on the Warrandyte Bridge between 8pm on Monday November 19 and 5am on Tuesday November 20 – with traffic allowed to cross the bridge, using only 1 (one) lane, under traffic management. If you are travelling across the Warrandyte Bridge or around the area between these times, please me mindful there may be delays to your journey. These works are advertised to allow the relocation of temporary safety barriers. The November/December update also indicates roadworks to expand the bus top on the roundabout are also due to occur in the near future – these works will allow articulated (bendy) busses to use the Warrandyte Bridge bus stop, the Diary is looking into this as we are unaware of any plans to introduce “bendy busses” to the 906 bus route. The bridge bus stop will be closed when these roadworks occur. When these works take place, the bus stop outside the Warrandyte Library will serve as the start point for the 906. The Warrandyte Diary will update this story as more details become available. With last weeks overnight closures cancelled due to the wet weather, VicRoads today announced the next string of bridge and lane closures starting this Sunday. On Sunday November 11, the bridge will be completely closed to traffic overnight, from 8pm Sunday to 5am Monday morning. As with previous bridge closures, pedestrians and bicycles will still be able to cross the bridge, under the guidance of traffic management. On Monday November 12, the bridge, and the roads around it, will be reduced to one lane, under traffic management between 8pm and 5am the next morning. On Tuesday November 13, the bridge and surrounding roads will again be educed to one lane, under traffic management between 8pm and 5am the next morning. As with the planned closures on November 7 and 8, these works are to facilitate asphalting and line marking – let’s hope the weather is more agreeable this time.